I have a Nintendo DS with one pixel that just doesn’t work the way it should. It looks like a white dot (sometimes it changes color, but ALWAYS the wrong one) on my screen. It’s just irritating on games like Animal Crossing, but for more time sensitive games, sometimes it’s a killer. It became so irritating, that I eventually just got a new DS. I found this awesome entry by Tina at MakeUseOf.com about how to fix a stuck pixel on your computer screen. If I had known about this, I might have been able to fix my Nintendo. Most of the software that she recommends is for Windows machines, but there are a couple of techniques to use if you have a Mac. It’s called JScreenFix and it’s a website you can visit. There’s even one that might work if it’s a different machine (like my Nintendo DS or a Sony PSP). Before you take that Mac back to the Genius Bar, try these techniques to see if you can reset your pixel on your own. I love watches, so a little part of me cringes when I see this sort of thing. There used to be a beautifully functioning watch that made up that motorcycle. It makes me sad to think of all the dead watches that were sacrificed to make these. I know watches die of their own accord, but it almost feels like a coat made out of the fur of a beloved pet. If you think this photo is the same as the previous one except that it’s a little out of focus, then you can understand why I find the accelerometer feature useless. The numbers are ever so slightly bigger in the second picture, but the difference is so minute that it makes me wonder why they bothered. Their execution of dual time is clunky. Sure, the cool thing right now is to have your time attached to wherever you’re living, but that is an extra feature that hinders rather than aids time setting. Instead of making me find the nearest city in my time zone, how about you just let me tell you what time it is now? Is that alright? Oh, and when I set the time in the other time zone, don’t make me choose yet another city. Just let me change the hours. Can you keep the minutes and seconds to match the original time line? No? Why is that? What planet do you live on? We’re all just separated by hours, not minutes. Is it really necessary for me to reset the minutes and seconds in EACH time zone? 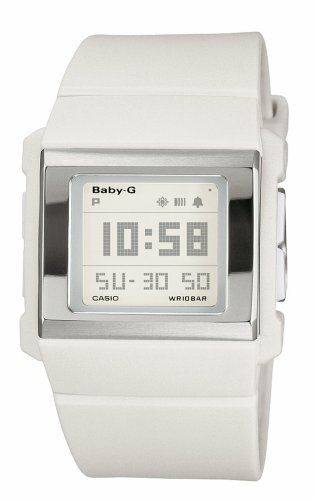 If you are in love with your shiny white Apple MacBook or your brand new 3G iPhone, then can have the Casio Baby-G to match. Otherwise, it’s just a bulky white watch that is close, but no cigar. It’s serviceable, but it is by no means the perfect watch. I am a big fan of Swatch, so I’m happy to learn that they are releasing a new mechanical watch. This one has a window on both the front and back so you can see the inner workings. Say hello to the Swatch Irony Automatic “Body and Soul”. It’s a skeletonized mechanical watch where both front and back are clear to allow an unobstructed view of the ticking heart inside. It only shows the time (no date, month or day of the week), but it’s a mechanical watch for less than 200 bucks. As a teenager, my favorite watches were made by Swatch. I could barely tell time on them, but they were so cool, I owned several of them. I STILL own them today and most of them are still running. That’s how well-made they were. Swatch is still ticking along. They just released a new line of watches called Puzzle Motion. They are like a kaleidescope of color moving on your wrist. If I have to have a watch that doesn’t do anything but tell time, at least it should show me pretty pictures. I have to give Suunto some credit. At least they’re trying to make a women’s digital watch that isn’t ugly. This is a pretty good looking watch for a digital, unfortunately, it’s not the kind of watch that will help me. I don’t need an altimeter, barometer, four languages or a compass. If I did need those things, I would wear the big ugly Casio digital that does all that for half the price. I don’t need my watch to be beautiful when I’m hiking. I need my watch to be beautiful all the other times of my day: walking around town, going to work, having dinner with friends. I want a pretty digital watch that will tell me the time and date on the face. I want an elegant digital watch that will time me with a stopwatch and give me a countdown timer. I want a lovely digital watch that will tell me what time it is in Vegas AND back home. And I want it to be small. I KNOW the watch manufacturers can do all of this, but for some reason they don’t. Good try, Suunto. Thanks for thinking of me. I really appreciate it. Game over, man. Try again. Via: Shiny Shiny: Sunnito Lumi – ‘An outdoor sports instrument for women’. Huh? This bracelet looking bangle could be the watch of my dreams. If the wearer is at work, it can be set to its ‘efficiency’ mode; the display is informative and easy to read. If, however, the watch is set to its ‘mystery’ mode, the panel expresses the time in a more imaginative, evocative style. Just pick the style to reflect your mood! The display is readable under very low light conditions, so no backlighting is required. Very low light conditions and total darkness are two very different things. I want a watch that can get me out of the World Trade Center when the lights go out like the IndiGlo watch did. Sorry, Seiko. You’re really close, but it looks like you’ll create a watch that’s just a piece of jewelry. I need more. I wrote before about Watch 2.0, but it still wasn’t perfect. Once I started working with beads, I was able to start on Watch 3.0. I have finally perfected it and I’m extremely happy with the outcome. The complete pattern is here for you to enjoy! For years, I have been complaining about how I hate the watch designers of the world. They cannot create a digital watch that is both pretty and useful. In the end, I have been wearing my Armitron watch that I got for about fifteen bucks about five years ago. It has all the features that I love, but it’s ugly. Linde Werdelinâ€™s Biformeter watch is EVERYTHING that is wrong with the watch industry right now. It continues like that for NINE paragraphs and doesnâ€™t tell me ANYTHING about the digital portion of the watch. Itâ€™s kind of a novel idea. The digital portion of the watch clips over the analog watch. Most of the time you can have your snooty watch, but when youâ€™re skiing, you can use your digital portion. Of course, Iâ€™m only guessing that the digital portion might have anything to do with skiing since they havenâ€™t told me anything about it. Someday, a watch company is going to stumble onto what I have been saying for years. They are going to design a digital watch that is beautiful and be completely perplexed when they sell it out.